Intelligence Officers graduated from Kinfe National Security Studies Institute. Abiy Ahmed attended the graduation ceremony today. 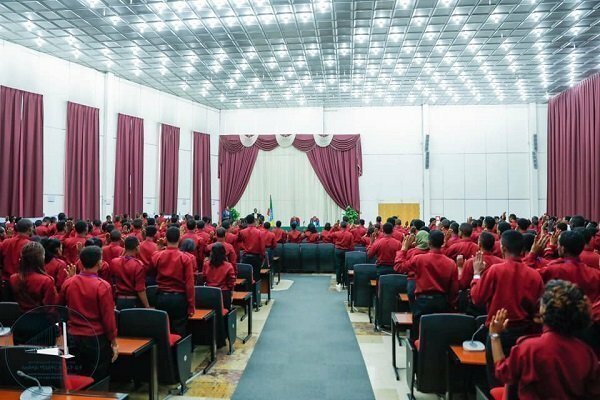 He told the graduates they need to be free from political, ethnic or religious affiliation as their only allegiance is to Ethiopia and Ethiopians disclosed the office of the Prime Minister. He also told the graduates that the graduates have a role to play a role in terms of making the institution free from all forms of allegiance except Ethiopia and Ethiopians. The officers have been trained for months as part of the reform process at the National Intelligence and Security Services (NISS), Defense Force and INSA. It was in June 2018 that Prime Minister Abiy Ahmed replaced former chief of NISS, Getachew Assefa, with Adem Mohammed with the aim to bring about an end to partisan operation of the agency. The former spy chief is currently a fugitive and is believed to be in Tigray regional state. In addition being implicated in egregious human rights’ violations as director of NISS, he is believed to be the master mind of some of the violence that Ethiopia experienced in the post TPLF era.